This course is produced by Lancaster University and the Royal Institution of Great Britain. The MOOC is intended for anyone with an interest in Humphry Davy, or early nineteenth-century literature, science, or history. 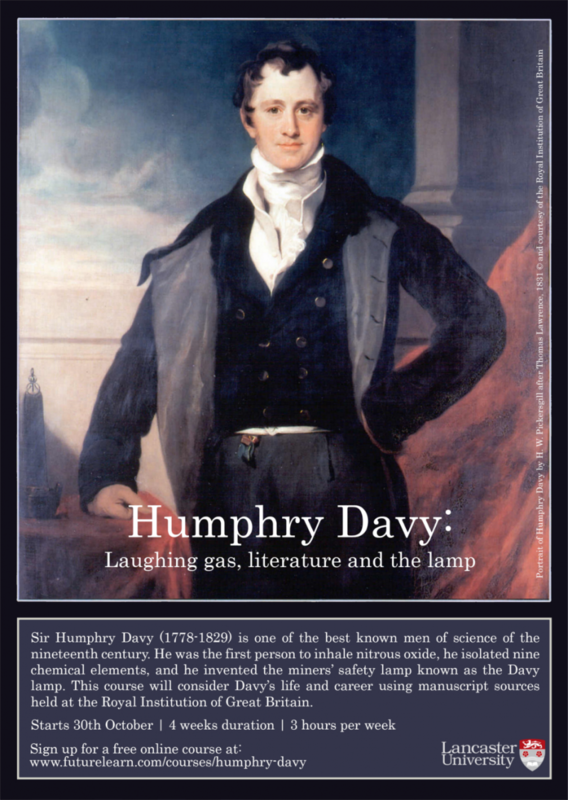 It will explore some of the most significant moments of Davy’s life and career, including his childhood in Cornwall, his work at the Medical Pneumatic Institution in Bristol and the Royal Institution in London, his writing of poetry, his invention of his miners’ safety lamp and the controversy surrounding this, and his European travels. The course will also investigate the relationships that can exist between science and the arts, identify the role that science can play in society, and assess the cultural and political function of science. The course will start on 30 October 2017, and will run for four weeks. Learners will typically spend three hours per week working through the steps, which will include videos (filmed on location at the Royal Institution), text-based activities and discussion, and quizzes. Learners will be guided at all stages by a specialist team of Educators and Mentors. It’s entirely free to participate, and no prior knowledge of Davy is required. If you have any questions, please direct them in the first instance to the Lead Educator, Professor Sharon Ruston ([email protected]).